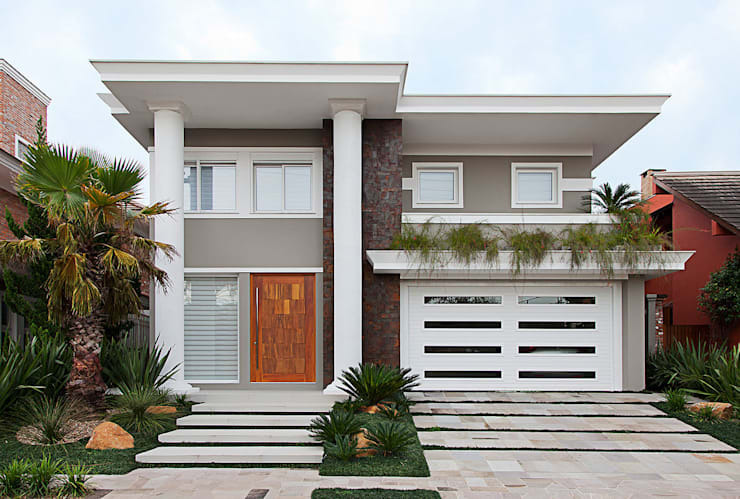 Andre Pacheco are architects who pride themselves on clean architecture, modern homes and tasteful decor. Today's example is no exception. 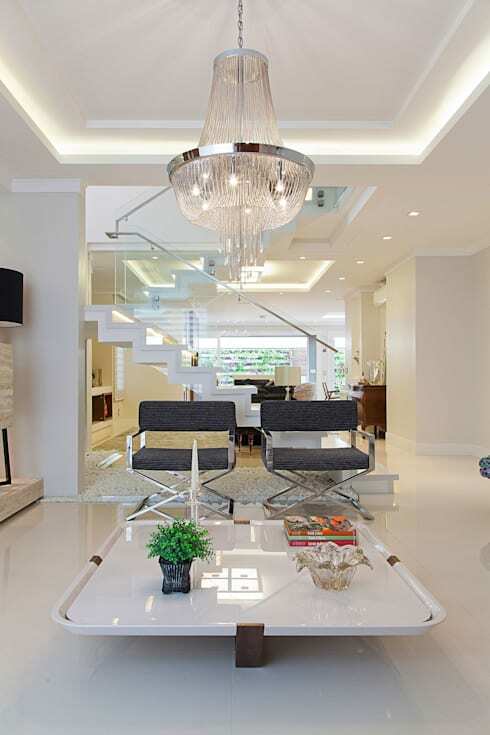 With subtle touches of glamour and luxury, this is a home that transforms into a beautiful and warm space that is as perfect for entertaining as it is for family activities. Today at homify, we are going to explore this home from the inside out, examining just how these architects have managed to achieve such a pristine and fabulous home. From the get go, we can see that this home oozes subtle sophistication. It's a double-storey home that is made up of neutral colours—white and grey. There are grand white pillars that flank the front door, which creates a very smart and poised exterior. It also works beautifully with the sleek white garage door and white window frames. A smart exterior is the key to a fabulous home. A garage is very important to this as it stores all of the cars, bicycles, skateboards and surfboards out of sight, creating a very neat and uniform look and feel. Don't you love how the designers have lined this space with gorgeous green trees and perfectly pruned bushes? Landscaping can truly make or break the first impression of a home. The living room is elegant and luxurious, with white tiled floors and white walls. There's also a fabulous and intricate chandelier, which hangs from the ceiling. Lighting is key in the living space, adding ambiance and romantic light to the space. Have a look through these homify lighting products for the living room for inspiration. The designers have added touches of charcoal black into this space, including armchairs and a tall lamp. When it comes to the living room, it's all in the detail. Tip: Add candles, a little pot plant, a vase of flowers or a gorgeous coffee table book for a touch of colour and inspiration. If we look at the living room from this angle, we can see how the home is open plan, with the rooms flowing into one another harmoniously. From this angle, we can see the very classic staircase, which is finished in beautiful white tiles with a glass railing. Staircases are a functional necessity to any home with more than one storey, but that doesn't mean they shouldn't look absolutely glorious. Remember that the space under your stairs should be just as important as the stairs themselves. Have a look at these creative ideas for the space under your stairs. The kitchen is minimalist and sleek, with white walls and furniture, silver appliances and grey cupboards. 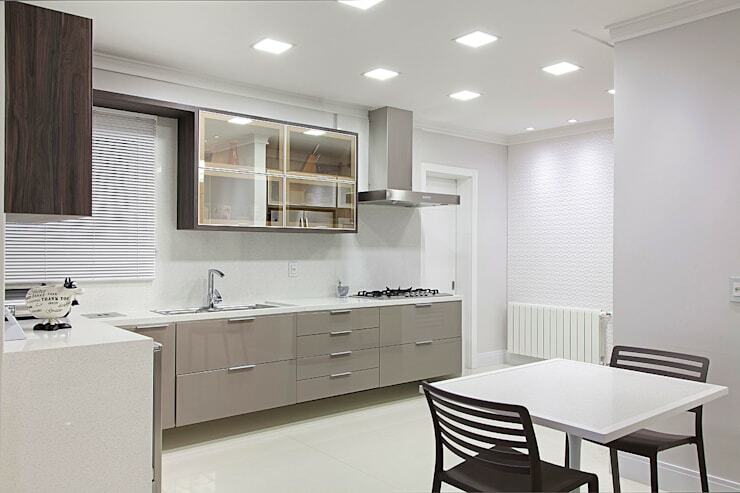 Neutral can work beautifully for the kitchen space, because it makes it look that much cleaner and more hygienic. You will want to cook up a storm in a kitchen like this one, because it looks so inviting! Remember that your kitchen should look neat at all times so utilise those cupboards and drawers. A little table and chairs in the kitchen, like these, are a fabulous addition especially in a family home. It allows for the kids to do their homework while mom and dad are cooking or for a casual catch-up between family members over a cup of tea. Pop some cupcakes in the oven while you're at it! 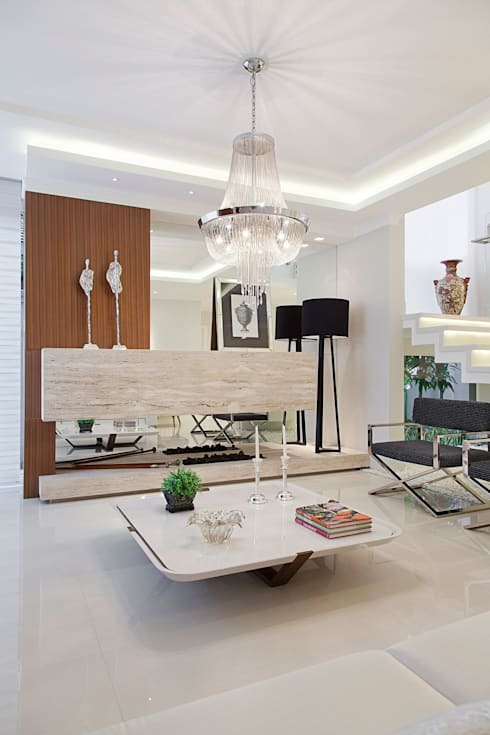 In this space, the designers add a flair of colour to a very neutral environment. 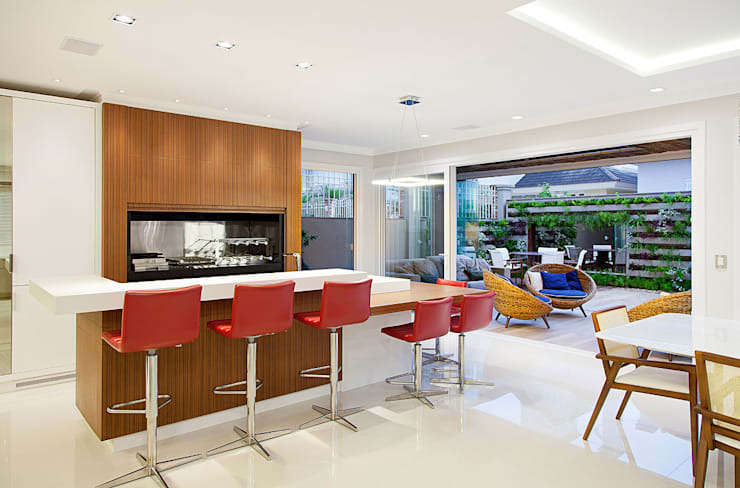 The white and wood come together perfectly in this space, but the designers have added a gorgeous, bold red to the bar, mixing up the look and feel of the home. This is meant to be a more fun space so there is room for a little flair of creativity and decor. Remember that you can do this in other ways too! Add artwork or decorative accessories to a space to really brighten it up. Homify has a range of beautiful artwork for inspiration! The best part of this home is the pool area—a true place to celebrate wonderful family memories. Pool parties, Saturday braai's, family games in the pool—this is a wonderful area for this. 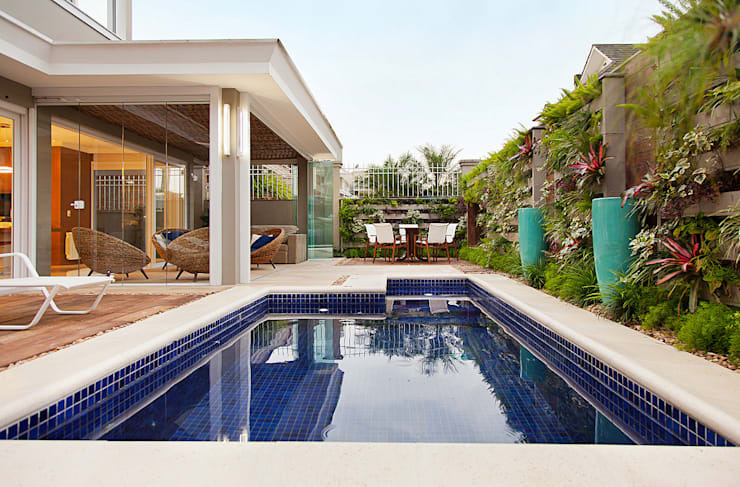 The designers have paired the pool area with functional, outdoor furniture including comfortable sofas and armchairs as well as an outdoor table and chairs. Remember that you can go for very comfortable outdoor furniture, but it should be durable. You want your furniture to last in the outdoor weather! The outside of your home needs just as much attention as the inside. Make sure that your garden is gorgeous, just like this one. What is your favourite part of this family home?